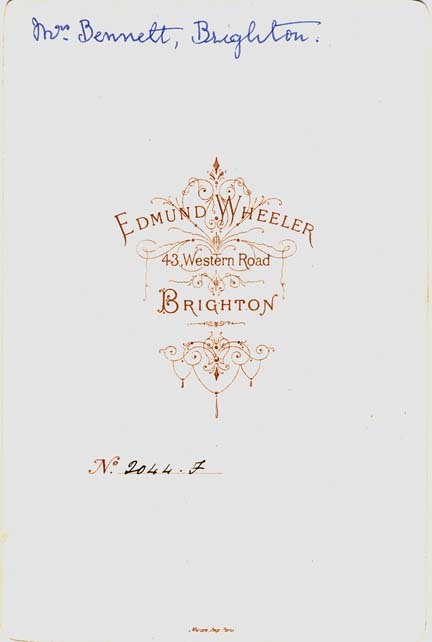 The Brighton photographer Edmund Wheeler junior (1836-1930) began to produce cabinet portraits at his Western Road studio during the 1880s.The photographer was already using a novel method of identifying the year a particular carte-de-visite photograph was taken by adding a suffix to the negative number, which was customarily written in ink on the reverse of carte-de-visite portraits. With his carte-de-visite portraits, each letter of the alphabet represented a particular year of business. For instance, suffix letter "F" corresponded to the year 1878. It appears that that there was not such a rigid system of classification when Edmund Wheeler increased his production of cabinet card portraits. With a scarcity of dated examples, it is difficult to produce a table for Wheeler's cabinet portraits which match the letters suffix on the negative reference with the year of production. 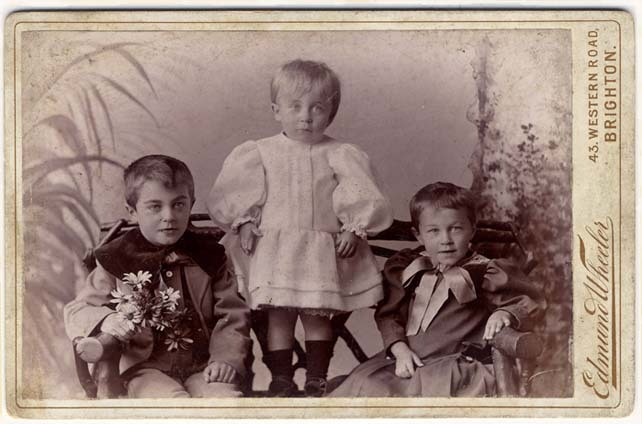 [ABOVE] A cabinet group portrait of three children, a photograph produced around 1900 by Edmund Wheeler of 43 Western Road, Brighton. Negative No. 3438 BB. It is rare to find a cabinet portrait by the Brighton photographer Edmund Wheeler that carries a date. 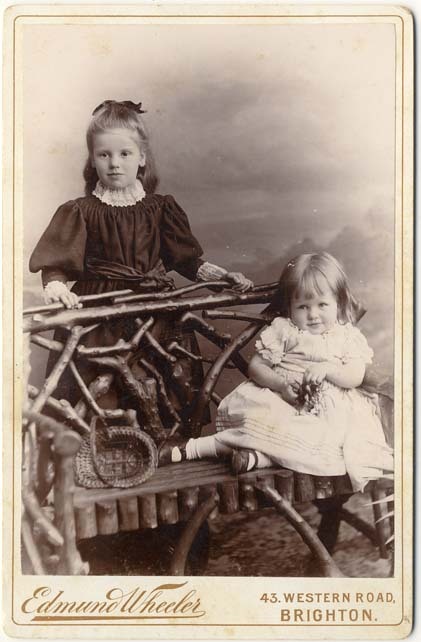 Martin Drew of Cardiff has kindly submitted portraits of his two great aunts, May and Daisy Drew, and both of these cabinet cards carry a 'photographic negative code' and one is inscribed with a date. The two cabinet portraits sent in by Martin Drew are pictured on the left. The cabinet portrait of the younger child (May Drew, who was born in 1892) carries the 'photographic negative code' number 1415 CC and a hand-written date of '1896'. The second photograph depicts May Drew's older sister Daisy Drew, who was born in 1888. 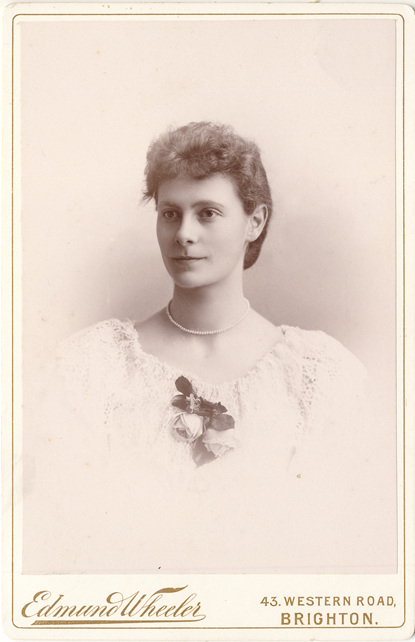 The cabinet portrait of Daisy Drew has the negative number 1482 CC written on the reverse of photographic mount. The cabinet portraits of May and Daisy Drew confirm that Edmund Wheeler was applying the suffix letters 'CC' to the negative numbers of the photographs he was producing in the year 1896. [far left] Cabinet portrait of May Drew (1892-1997), photographed at Edmund Wheeler's Brighton studio in 1896. Negative No. 1415 CC. The date '1896' is inscribed on the reverse. [near left] Cabinet portrait of Daisy Drew (1888-1990), photographed at Edmund Wheeler's studio at 43 Western Road, Brighton. Negative No. 1482 CC. 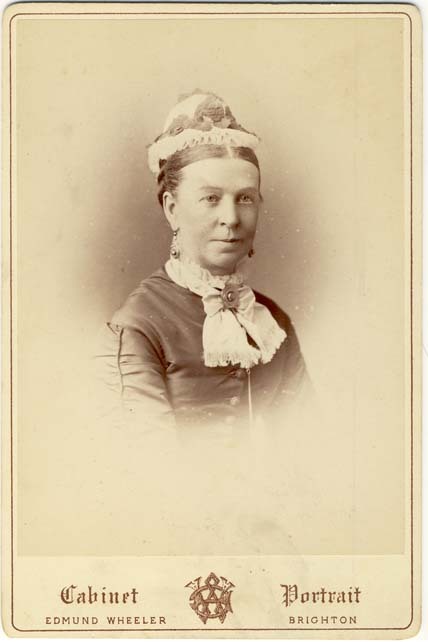 [ABOVE] A cabinet portrait of Mrs Bennett, photographed around 1878 by Edmund Wheeler of 43 Western Road, Brighton. Negative No. 2044 F. [ABOVE] The reverse of the cabinet portrait of Mrs Bennett by Edmund Wheeler of 43 Western Road, Brighton, illustrated on the left, showing the negative reference number of 2044 F. [ABOVE] A cabinet portrait of Mr Bennett, photographed around 1878 by Edmund Wheeler of 43 Western Road, Brighton. Negative No. 2043 F.
[ABOVE] A cabinet portrait of Edward Wesley Tebbs (1861-1933), a Brighton tailor, photographed at Edmund Wheeler's studio at 43 Western Road, Brighton. (Negative No.292 AA). Edward Wesley Tebbs was born in Kensington, London, in 1861. Edward Tebbs started his working life as a draper's assistant in Brighton, but he later joined a tailoring business and appears to have entered into a partnership with a fellow tailor named Benjamin Lee. The two men established a tailor's shop in Trafalgar Street, Brighton. In 1890, Edward Tebbs had married Minnie Amelia Gander (born 1869, Shere, Surrey), the daughter of Jesse Gander, a farmer in Balcombe, Sussex. 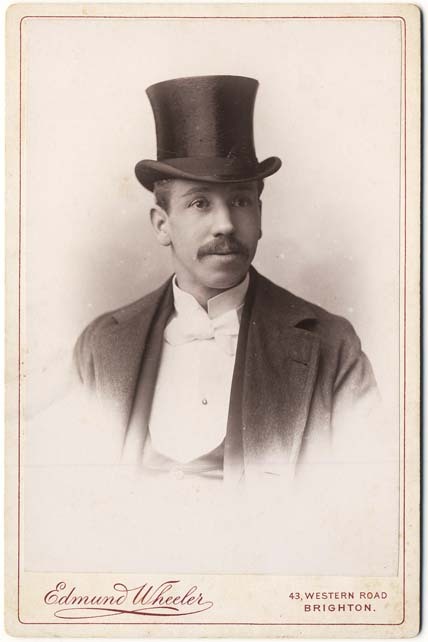 By 1899, Edward Wesley Tebbs was running a tailoring business in Brighton and living at Cheriton Lodge, Hampstead Road, in the Preston district of Brighton. [ABOVE] Another cabinet portrait of the Brighton tailor Edward Wesley Tebbs (1861-1933), photographed at Edmund Wheeler's studio at 43 Western Road, Brighton. This studio portrait was possibly taken a day later than the top-hatted portrait of Edward Tebbs, pictured on the left, as it carries a negative reference number of 318 AA. 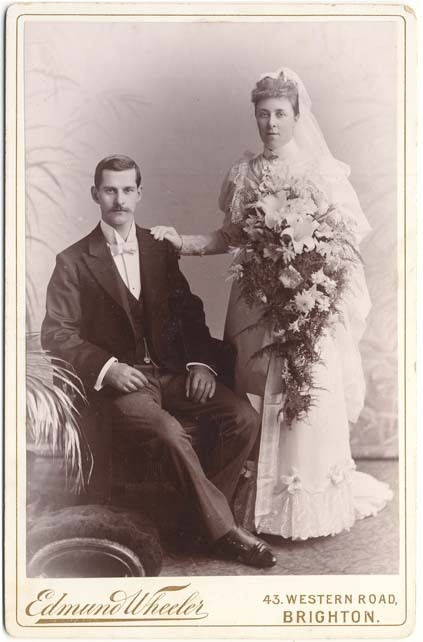 Edward Tebbs had married Minnie Amelia Gander (born 1869, Shere, Surrey) in 1890. 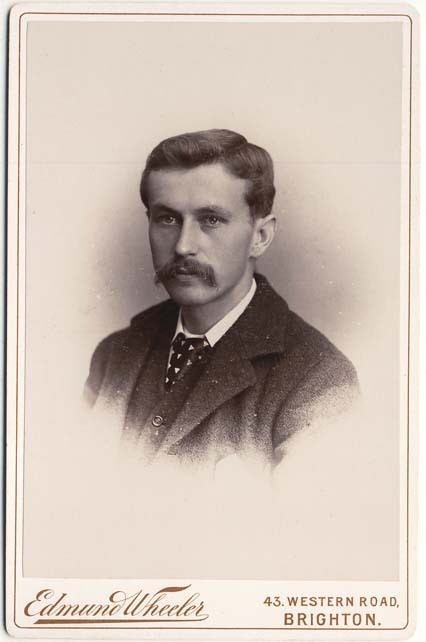 By the time this photograph was taken around 1894, Edward Tebbs was the father of two daughters - Jessie Elizabeth Tebbs (born 1891, Brighton) and Elsie Amelia Tebbs (born 1894, Brighton). By 1915, Edward Tebbs and his family were living at 11 Surrenden Road, Preston Drove, not far from Brighton's Preston Park. 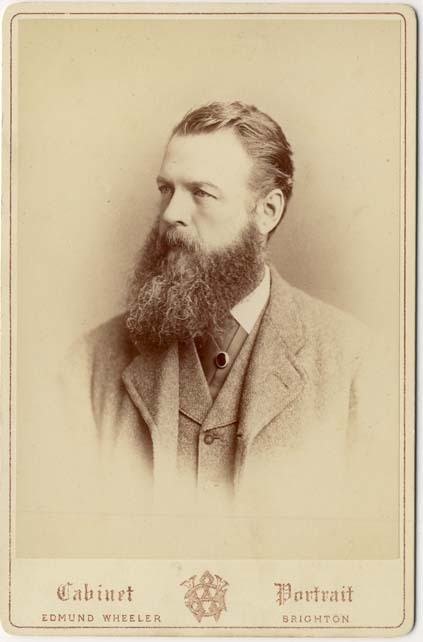 Edward Wesley Tebbs died in Brighton in 1933 at the age of 72. [ABOVE] The reverse of the cabinet portrait illustrated on the left, showing the 'letter code' used by the Brighton photographer Edmund Wheeler. The letters of the alphabet were used to indicate the year of production. In this example, Edmund Wheeler has used the double letter "AA". There is some evidence that Wheeler was applying the suffix 'AA' to the photographic negatives he was producing between 1894 and 1895. 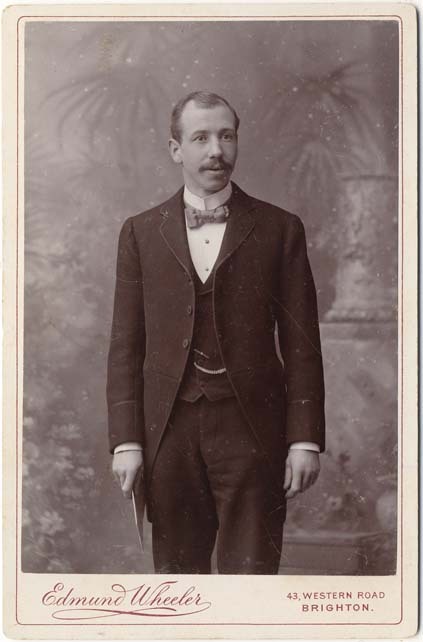 The cabinet cards were manufactured and printed by W. Hermann & Co. of Berlin and London. 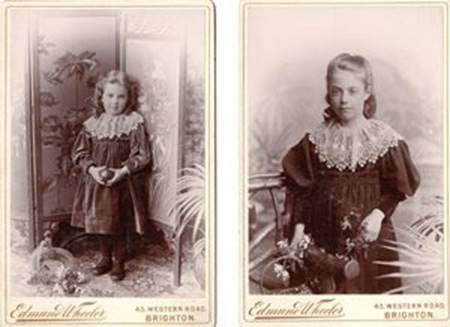 [ABOVE] A cabinet portrait of two sisters, photographed by Edmund Wheeler of 43 Western Road, Brighton. Negative No. 1330 DD. (circa 1897). 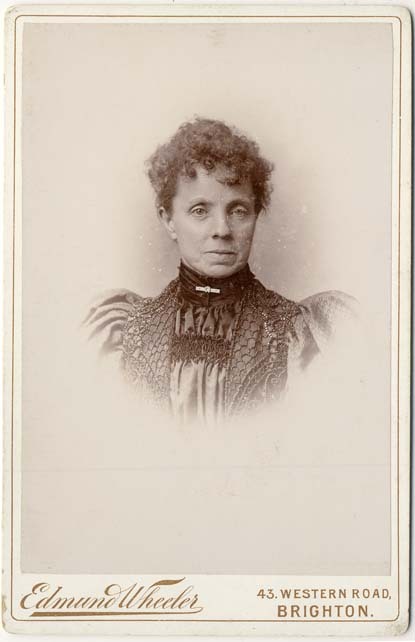 [ABOVE] A vignette portrait of a middle-aged lady, a cabinet card produced by Edmund Wheeler of 43 Western Road, Brighton. Negative No. 2942 DD. (circa 1897). [ABOVE] A vignette portrait of a young man with a moustache, a cabinet card produced by Edmund Wheeler of 43 Western Road, Brighton. Negative No. 2606 DD. (circa 1897). 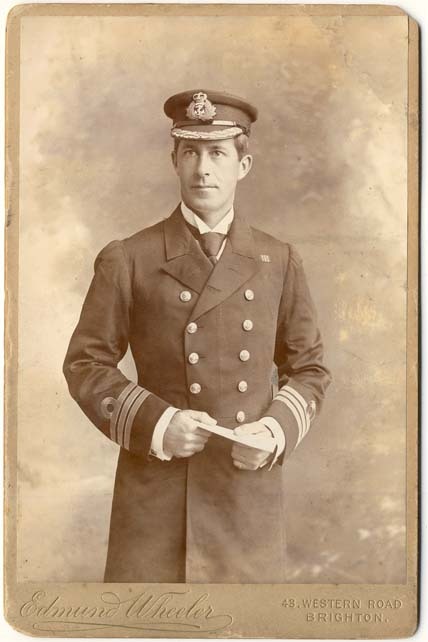 [ABOVE] A cabinet portrait of a Royal Navy officer, photographed by Edmund Wheeler of 43 Western Road, Brighton. Negative No. 2949 EE. (circa 1898). 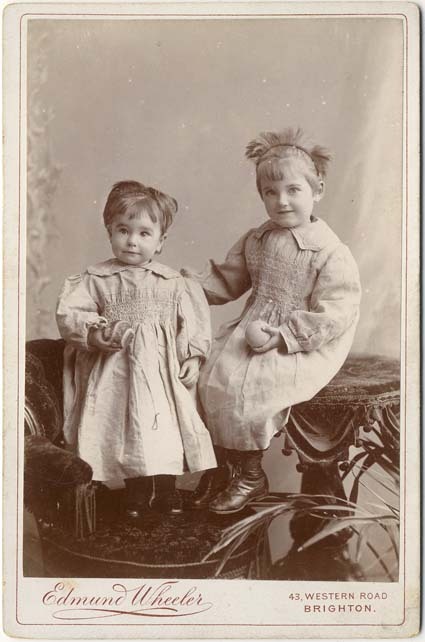 [ABOVE] A cabinet portrait of two children, photographed by Edmund Wheeler of 43 Western Road, Brighton. Negative No. 2303 GG. 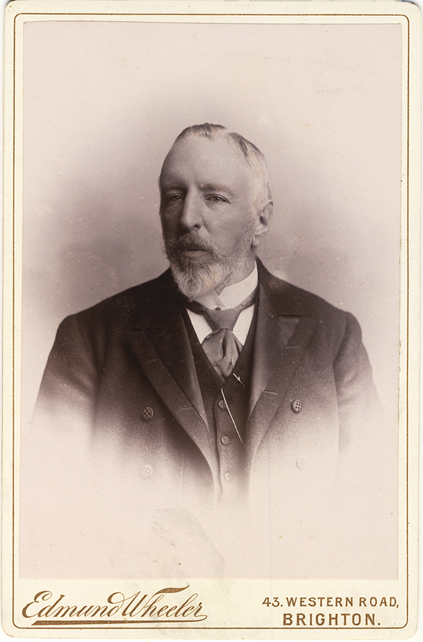 On the reverse of this cabinet portrait is the hand-written inscription "Sept 1900". 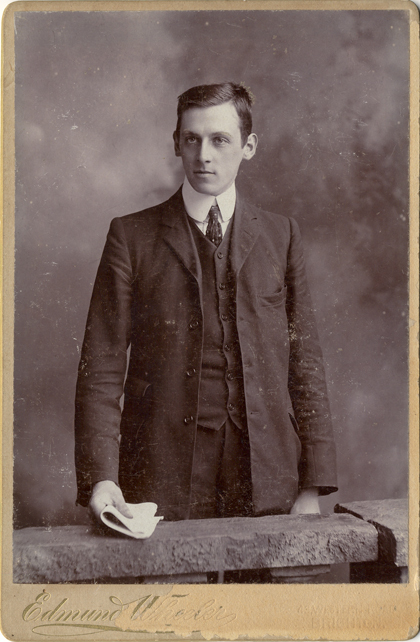 [ABOVE] A three-quarter length portrait of a young man, a cabinet card produced by Edmund Wheeler of 43 Western Road, Brighton. Negative No. 1897MM. (circa 1906). Plain back. 000-3000 Edmund Wheeler (front) Cream card. Decorative text (back). W. Herrmann & Co.
[ABOVE] A wedding portrait of a groom and his bride, photographed by Edmund Wheeler of 43 Western Road, Brighton. Negative No. 1377 aa. [ABOVE] A portrait of a young woman, photographed by Edmund Wheeler of 43 Western Road, Brighton. Negative No. 1506 aa. 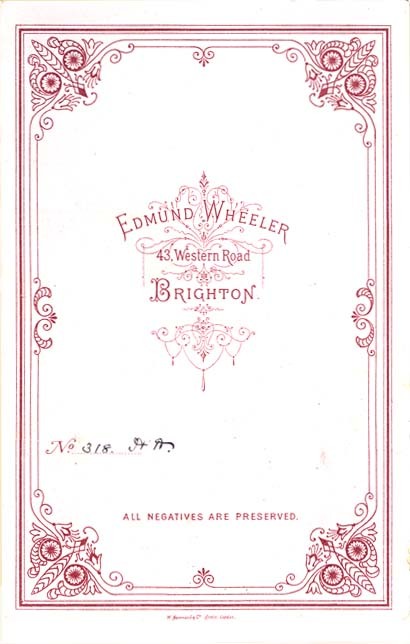 [ABOVE] A portrait of an elderly man, photographed by Edmund Wheeler of 43 Western Road, Brighton. Negative No. 2776 aa.